In 1861 with the onset of the Civil War coming, Maid of the Mist owner, W. O. Buchanan decided to put the Maid of the Mist II Steamship up for sale. Tourist travels were likely to be curtailed, and Buchanan faced financial difficulties to begin with. It has been said that the Sheriff was going to confiscate the ship to satisfy the mortgage. So the 72 foot ship went up for auction. The winner, a Montreal businessman, wanted the boat delivered to Queenston, Ontario across from Lewiston, NY. 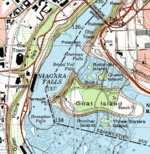 That would require a trip through the Great Gorge Rapids, the Whirlpool, and the Lower Niagara Rapids. This was a feat that had not been accomplished at the time or since (in such a large ship), and many thought it foolhardy. A man who knew the boat and the river the best stepped forward to take his chances with fate. Capt. Joel Robinson enlisted two other brave souls, engineer James Jones and mechanic James McIntyre as crewmen. Capt. Robinson had a lot of experience on the ship as he piloted it shuttling tourists up to the base of the Falls. Around 3pm on June 6, 1861, he turned the ship northward from her moorings and headed into the rapids. As the first waves struck the boat the crew were thrown to the floor. Spectators lined the gorge to view the adventure. The boat journeyed through the waves at thirty nine miles per hour, something neither the boat nor the crew had experienced. Eyewitness, Thomas McKnight said, "The boat plowed through the rapids and was wrenched and tossed by the great waves that at times sank her almost from sight, but she got through all right." "In the trip," McKnight said, "the only accident occurred when the boat passed under the old suspension bridge. The guy cables of the bridge caught her smokestack and over it went." The boat was delivered to safety in Queenston, (away from the American Sheriff). It is said that the trip caused the Capt. to give up the career he loved, and he retired in seclusion, passing away 2 years later. Earlier in his career he walked out into the rapids immediately above the American Falls with the only the aid of an iron staff. He landed on a small rocky island in the middle of the channel, and it is now named Robinson Island. Along the way, Capt. 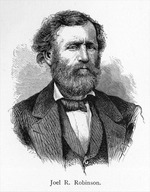 Robinson saved the lives of many people in peril along the river, as well as retrieving the bodies of those who didn't fare as well. As a side note, Capt. Robinson has a zinc monument, sometime called white bronze (a marketing ploy by the manufacturer). The monuments were popular in the late 1800's and early 1900's. They were rumored to be sold in the Sears catalog, but there is no evidence for this. 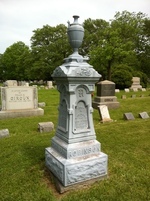 Once you see one with it's distinctive blueish color, you will notice more in Oakwood Cemetery. The zinc monuments have held up well over the years, much better than some of the stone monuments. To find the Capt's monument, turn left after entering the gates from Portage Road. Follow the outside road on the north side of the cemetery to the area between Section 4 and 5. You will see his marker on the right.